Bad breath is quite a common and very embarrassing problem. It is caused by a poor dental care and oral hygiene, irregular brushing and flossing your teeth that results in excessive amounts of bacteria on the teeth and tongue. If you are facing difficulties fighting against bad breath, herbalists can offer you a series of effective and safe solutions. You can use the herbs which can assist in lowering the amounts of bacteria in your mouth and eliminating bad breath. 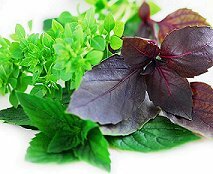 Those are, first of all, such herbs as Parsley (Petroselinum gen.), Basil (Ocimum gen.) and Coriander (Coriandrum sativum). These herbal remedies are rich in chlorophyll, a green pigment. It is a very powerful natural freshener with very strong deodorizing effects. Also, it is possible to use Dill (Anethum graveolens). To get rid of bad breath instantly, it is possible to chew on some dill seeds or drink a cup of special dill tea (should be prepared like usual black tea). There are more herbs which can refresh your breath. The plants of Cardamon family (Zingiberaceae) contains a chemical element, which can be found in Eucalyptus. It has excellent antiseptic properties, can kill almost all know oral bacteria and refresh your breath. The same can be said about such herbs as Peppermint (Mentha piperita) and Clove (Eugenia aromaticum). Anise seeds have been used for centuries as an effective herbal remedy for many health problems and ailments. It is a truly legendary herb, but not many people know that a special mouth rinse made of anise can replace the most effective modern mouth washes based on chemicals. All you need to do is steep a pinch of anise seeds in 100 ml of boiling water and wash your mouth after having meals. please help me to cured my badbreath what i do? or I supposed to do?